LH 974.7 Ams. 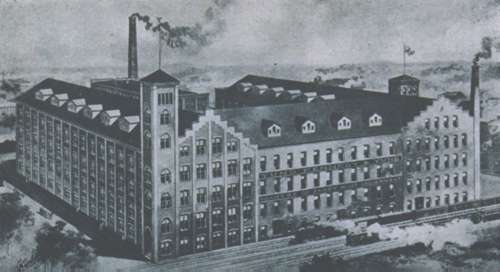 "Yund, Kennedy & Yund Knitting Mills". Black and White photograph in Amsterdam, New York 1907 printed by Noteworthy Co. , Amsterdam, NY. 22 cm. 30 pages. This picture of the Yund, Kennedy & Yund Knitting Works is a typical example of the mills (rug, button, broom, knitting) located in the City of Amsterdam at the turn of the century. Also included in this pictorial history are banks, churches, schools, streets and private residences in Amsterdam during this same era. Copyright © permission granted by Ethel Donlon to reprint the photograph of Yund, Kennedy & Yund Knitting Mills, 1907.